Jobs Description: KPPSC Advertisement 02/2019 is given below on our site. Visit our site to view KPPSC Advertisement 02/2019. 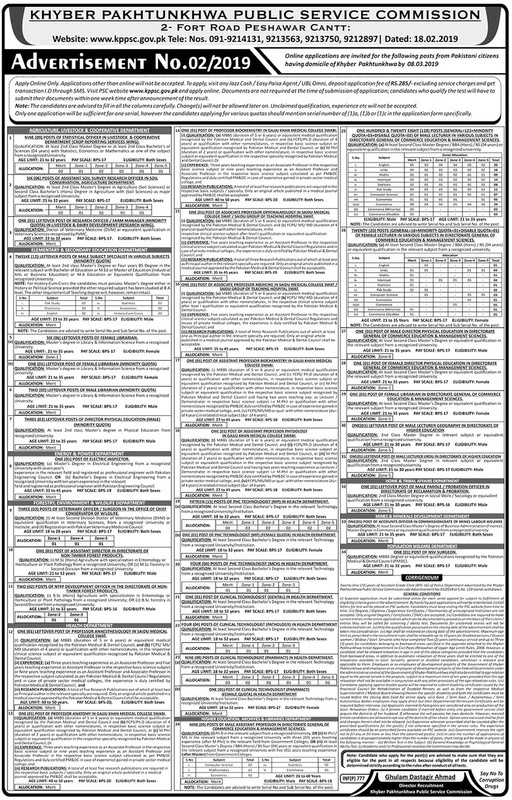 Khyber Pakhtunkhwa Public Service Commission recently announced an advertisement for Jobs in Agriculture, Livestock & Cooperative Department, Elementary & Secondary Education Department, Energy & Power Department, Foresty, Environment & Wildlife Department, Health Department, Higher Education, Archives & Libraries Department, Home & Tribal Affairs Department, Mines & Minerals Department, and Population Welfare Department. KPPSC Jobs February 2019 are listed below as per department name.